All snarkiness aside, Berra was on to something. One of the keys to success is first understanding what success looks like. This advice can apply to all areas of life and blogging is no exception. Blogging can be an incredibly effective marketing tool, but you can’t simply start a blog and expect it to drive success. In fact, a lot of people who go about blogging have no real plan beyond just writing the posts and seeing what happens. There’s more to effective planning than simply mapping out a robust content strategy and editorial calendar. One of the most important parts of starting a successful blog that many fail to consider is hammering out core objectives from the start. Regardless of whether you plan on having your blog serve as a lead generation tool, the centerpiece of your content strategy or just as a way to put your company’s thoughts out in public from a branding perspective, there is always a way of quantifying these results and tracking them. 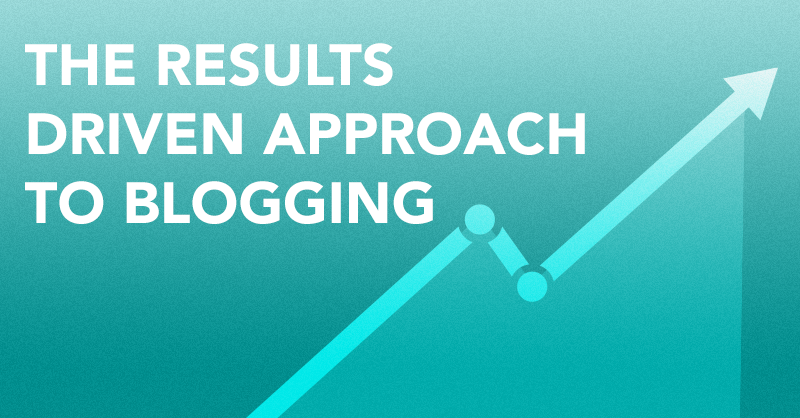 This is the core of a results-driven approach to blogging, here’s how it’s done. So, you want to start a blog? Now the important question to answer is why are you going through the effort. Oftentimes companies will start a blog just because they feel that they have to. In my last article, I quoted a statistic from IBM, and I’ll quote it here again because I feel it speaks so much truth about the dismal state of corporate blogging. Nearly 80% of corporate blogs have five posts or less. This is a staggering figure, but it’s actually pretty easy to believe. Many companies start blogs and quickly lose steam in large part because they never define success. 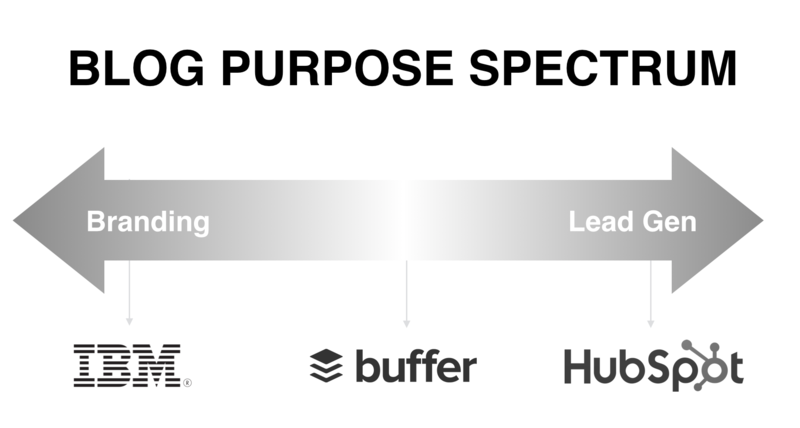 When I say you need to define your blog’s purpose there are really two elements to doing so. The first step is to define the general purpose of your blog. A blog can be a pretty versatile marketing tool that achieves a wide variety of goals, but the majority of them fall along a spectrum that extends from branding to purely sales. A blog like IBM’s or GE’s will never really be considered a direct sales tool. IBM in particular deals with far too large of clients to ever have someone read their blog and decide then and there to become a customer. Rather, IBM uses their blog as a purely branding tool, and they do this very well. On the other end of the spectrum is a company like HubSpot whose primary sales tool is there blog. 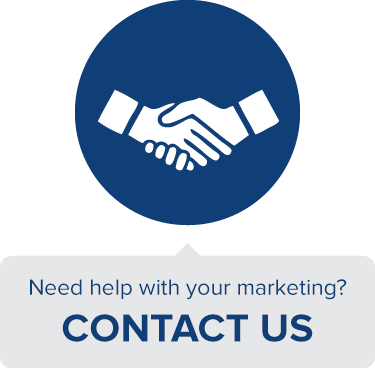 At nearly every turn their readers are presented with a call to action of some sort that directly relates to the blog article a potential customer is reading. These frequent calls to action would be out of place on IBM’s blog, in much the same way that IBM’s lack of CTAs would not do well for the HubSpot blog. Understanding your blog’s general goal is the first step towards building a results driven approach to blogging. The next step (which directly follows from the first) is to take these qualitative goals and attach them to quantitative metrics. Put plainly, you need to see what numbers you can look at to tell how well your blog is doing at driving your broader goals. Depending on your blog’s general purpose, these KPIs will likely vary. In fact, most really good KPIs are actually combinations of more elemental metrics. Instead of looking at a simple number like page-views or social-shares, it makes a lot more sense use a blended metric (for example) like social-shares and page-views. This is just an example, but using these kinds of blended metrics gives you a more nuanced understanding of your blog. Whereas measuring either of these metrics individually might give you an understanding of how good your blog content is at attracting attention in a silo, but the numbers combined tell a more robust story that gives you more information about your content’s ability to engage your audience as a whole. In addition to focusing on a few blended metrics, another important consideration when building metrics is to understand attribution and the customer journey. In an excellent addition of Moz’s Whiteboard Friday Series, CEO Rand Fishkin discusses what he considers the number one misconception surrounding content marketing. This misconception is that content will lead directly to the desired outcome. Whether your blog is focused on building your brand, driving sales or a combination of the two, it is exceedingly unlikely that the first touch you have with your customer will be the one that converts. Something tells me that this misconception lies at the heart of the reason that 80% of blogs don’t make it past five posts. Even if they do know what they want their blog to do and have devised KPIs to measure these goals, you will likely give up if you expect results to register immediately. In the video Rand admits that even Moz (who has one of the best marketing blogs out there) will have a customer interact with their content an average of seven times before they convert. This points to two key takeaways. First of all, blog content requires multiple touches to convert customers. The second conclusion that follows is that in order for your measurements to be useful, they need to account for the fact that results come from long-term customer interactions. Rand tells us that Moz measures their interactions using specialized paid tools like KISSmetrics, and while this is a very valid way to go about modeling attribution, it is not the only way. There are many ways to build out an attribution model. One way is to tag your links shared on social media with UTM parameters for more precise tracking in Google Analytics with Google’s URL builder. Unique parameters are sent to your Google Analytics account each time a person clicks on these tagged links shared on social media and elsewhere, so you can identify the URLs that are most effective in attracting users to your content. 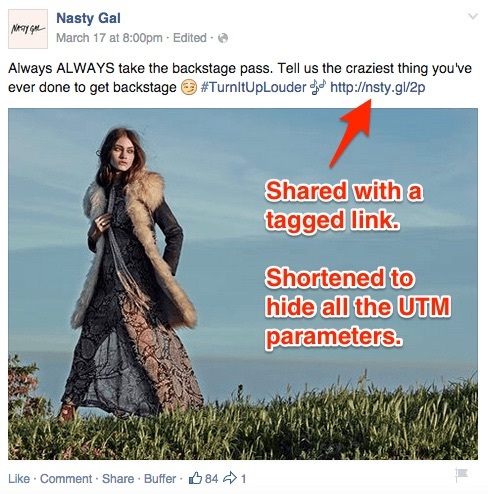 Businesses often shorten these tagged links when sharing them on social media to make them more aesthetically appealing and to hide all the UTM parameters that make the URL quite long as seen above in this Facebook post shared by women’s apparel brand, Nasty Gal. Once you can pinpoint the specific source of your traffic and engagement with your blog, then you can start to combine this information with your KPIs and set up tests to better understand your blogging efforts moving forward. Collecting accurate and relevant information, is only one half of being results-driven with blogging. The logical next step is to have your information actually drive the way that you produce, promote and display your blog content. How much more insane is it then to know (or at least have a good idea) of what works and what doesn’t and still do the same thing. The true definition of a results-driven approach is to have the process systematically change to reflect the data on a consistent basis. Regular tests are the hallmark of the scientific method and should serve as the engine that runs a results-driven blog. A fantastic example of a real results-driven organization are the mad, viral scientists over at BuzzFeed. Since their primary goal is to drive social sharing, BuzzFeed’s key concerns are over the efficacy of their headlines and feature images. As such, they test dozens of different permutations in real time and kill off all but the best. Not only do they run this rigorous testing for every single story that they put out, but they systematically incorporate the results into their future iterations meaning that their headlines and images are constantly getting better. After all, evolution has produced the best real-life viruses, so replicating this “survival of the fittest” testing strategy naturally leads to the most viral content. Another example on a more modest scale comes out of Refinery29’s insightful R29 Intelligence blog. Their blogging team decided to test the changes of something as small as a reconfiguration of their mobile, social sharing button. The change is hardly recognizable, but the results are staggering. A slight change in the size and selection of buttons led to a 20% boost in overall social sharing on their publication via mobile. Being the data-driven company they are, this change was soon implemented site-wide. Being results-driven is not something you just become, it is a process and state of mind. It means constantly questioning assumptions and re-evaluating what you think you know. While data often leads to better decision-making, relying too much on data can sometime lead you astray. Keeping your head down and blindly following the data can be just as dangerous as ignoring it. In this helpful article, Google’s Digital Evangelist, Avinash Kaushik talks about the dangers of choosing the wrong KPIs and following them without having a larger idea of the bigger picture in mind. As you move towards implementing a results-driven approach, always keep in mind that data is meant to check your intuition – not to replace it. In this short, but sweet post from Gary Vaynerchuck, he acknowledges that, while data is important, trusting his intuition has certainly helped him choose an overall direction when the data may have been scarce or non-existent. Once you’ve chosen a general direction for your blog, there is no better way to achieve your goals than embracing the right balance between data and intuition.